Pat Ferguson performs every Wednesday the Wise Restaurant & Bar in the HotelRed from 6-8 pm. He also holds a monthly residency at the Up North Bar. Light of Day / Dark of Night can be purchased here. The city of La Crosse has produced some fine musicians over the years. One of the musical groups to emerge in the early Naughts was the Smokin’ Bandits whose lineup featured Pat Ferguson and also Craig Baumann. The band electrified its bluegrass-meets-southern rock and is still performing occasionally after fifteen years. At the nucleus of the Smokin’ Bandits were Ferguson and guitarist Christian Staehly. Staehly’s brother Chad also collaborated with both Ferguson and the Smokin’ Bandits and would later figure prominently in Ferguson’s solo career. Musically the Smokin’ Bandits offer few glimpses of what was to come for Ferguson, who has developed into a fine acoustic guitar finger-stylist and a songwriter capable of reaching into the depths of both despair and gratitude to fuel his inspiration. But the world is currently busting at the seams with sensitive New Folk singers brandishing wooden guitars, both male and female, as the economics of music in combination with technological advances continue to move artists toward simpler means of expression, both in recording and performance realms. 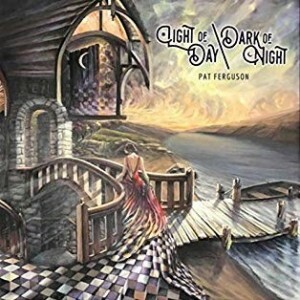 With such proliferation Ferguson was able to break through by developing expansive arrangement techniques, transforming standard singer-songwriter fare into mini-epics, and by capitalizing on his history with his producer Adam Gruel and with Chad Staehly. Chad Staehly relocated from Green Bay to Colorado in the early Nineties, attending Colorado State in Fort Collins, forming highly successful jam band Great American Taxi and eventually taking on the role of keyboardist in roots group Hard Working Americans fronted by vocalist/guitarist Todd Snider, an artist that Staehly had managed and performed with. He also helped establish LoHi Records, a label based in North Carolina. Adam Gruel, a member of Horseshoes & Hand Grenades, first sat in with the Smokin’ Bandits when he was thirteen. Gruel became a producer, learning a lot from H&HG sessions. For Ferguson, the choice of someone he could trust and already had a rapport with was crucial. Together they honed the music, Gruel contributing guitars and vocals as well. They then approached Chad Staehly and Lo-Fi, getting the thumbs up from him and his Lo-Hi partners Todd Snider, Tim Carbone, and Jim Brooks. Chad Staehly also appears on two of the album’s tracks. Madisonians will recognize another key contributor’s name, Wheelhouse’s Kenny Leiser, whose violin playing is all over the recording. Leiser also arranged the strings section that appears, another musical element that helps set Light of Day / Dark of Night apart. The album opens with “Intro,” and at just over a minute it encapsulates Ferguson’s guitar style; open chords, delicate fingerpicking with a strong melodic line, a fast, inventive run and a folky bend at the end, just to let the listener know where all this came from. This is followed by “Howl,” the strings arrangement predominant. Here is a perfect example of Ferguson’s penchant for abandoning traditional form for progressive song development. The middle section is more than mere departure, shifting in rhythmic and melodic structure. Ferguson likes to contrast elements of the natural world with human relationships, a common thread in the lyrics. “To live in a scene where the moon and the breeze / Cite a strange rotation / And somewhere between your body and me / Lies this expectation.” The middle section morphs back into the original song with the strings playing a menacing “Kashmir”-like pattern. A drawn-out coda – another recurring feature on the album – brings the track to a close. This is an exceptional piece of songwriting. Ferguson is able to move stylistically between tracks. The boots-and-handclaps of “The Night (The Temptress),” with multiple vocal harmonies and a country/rock lilt in the Marshall Tucker vein, gets followed by “From Me to You,” with a spacey, reverb-drenched indie-folk sound. Ferguson’s use of chromatic chord changes and inner notes sets him apart from the bountifully typical cowboy-chord minstrels. Leiser’s violin is sweet here, breaking into a string section interlude, perfectly tracking Ferguson’s fingerpicking in a nice piece of arrangement, reprising in the coda. Chad Staehly adds piano and Dead Horses’ Sarah Vos adds harmonies. The album’s centerpiece, at nearly ten minutes in length, is “Part II,” a folky tune that manages to shun traditional structure once again; its opening salvo veering off into sections that hint at verse-chorus construction. There’s a lovely, extended instrumental break that has Yonder Mountain String Band’s Jacob Joliff trading mandolin licks with Leiser’s violin before both become fully orchestrated with the rest of the strings. The opening returns to close the song in restrained tones. Elsewhere, “Blind” has a Grateful-Dead, rootsy vibe and is the only song with drums on the entire album. Both “Fuel the Tide” and “I Won’t Forget You” are paired down arrangements with only violin, bowed bass and guitar. The layered vocal harmonies add depth to these, the former imbuing the hope of a parent to his children while the latter’s tenderness makes a fitting closer. There is plenty of beauty permeating Light of Day / Dark of Night. With emotional directness Ferguson is able to stand out in the crowded field of modern folk contemporaries. His inventive approach to the guitar and to his arranging are able to set him apart. Though he’s a seasoned professional, this is a strong solo debut, one that bears the hallmarks of a truly gifted songwriter and of more good things to come.